No show for the last few weeks as Zamo has been on strike due to the snowstorms which have been sent by an angry god to punish Technical Support Monkey for watching YouTube videos on Mount Everest, even though Chimpette insists she didn’t start watching until after the snow started. In other news, Mr. Hydell insisted on watching football when Iggy wanted to watch crocodiles eating zebras. Chimps, man… but at least Technical Support Monkey was finally forced to admit Zamo was right about her terrible paint color choices, at least in terms of the red studio paint. The battle over color choices for Technical Support Monkey’s house rages on, with Chimpette refusing to believe it when Zamo tells her God wants her to paint the bathroom green. At least she chose a nice blingy gold light fixture worthy of Trump Tower which Zamo approves of. 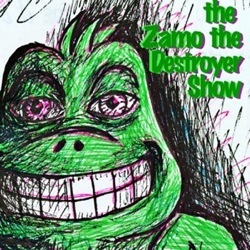 In other news, it turns out Mr. Hydell has bought a place down the street and he comes over and describes Technical Support Monkey’s color choices as “a Mexican whorehouse.” Based on that, Zamo figures Chimpette’s garish colors are intended to make Whatsisface Guitar Dude feel at home. Also, Technical Support Monkey doesn’t know the difference between pounds and kilograms when it comes to either cocaine or mail-order sofas, and Zamo thinks Chimpette’s rug choice has a coded Wikileaks-related meaning.